National Sovereignty vs. National Solvency? So, what happens when a country increases government spending, enlarges its deficit, and causes an international lender to consider stopping payments for what it sees as an abuse of discretion? No, it’s not the Chinese trying to reign in the Obama Administration. But Ukraine’s decision to raise pension payments and its minimum wage is putting pressure on the International Monetary Fund (IMF) to decide whether its lending guidelines have any teeth. At first blush, the IMF appears to be meddling in the internal affairs of a sovereign country. On further reflection, though, the IMF is really just a lender of other people’s money trying to get an increasingly bad borrower to stop charging the international community’s credit card. The dilemma posed by governments that spend money as though there is no consequence for perpetual deficits is that unlike private parties, a government cannot be foreclosed, bought, and sold. At least, not yet. Ukraine isn’t yet a failed economic state, but if the IMF decides to cut off lending it could be. Who knows; perhaps the Chinese government officials holding all that American debt are taking notes on how to control a client’s spending. Even the exact hour mattered: The wall opened when many East German political and military leaders were sequestered in meetings, and many significant Soviet leaders — because of the time difference — were already asleep. What if they’d had time to fortify the borders before the flood of people arrived? As it was, none of them could mount an immediate response, and soon it was too late to undo the events of the evening. We like to think that all great events have great causes, and obviously long-term political, economic and military forces shaped the Cold War — and how it ended. But momentous events are also a sort of ambush of history, when all those long-term pressures come together in an unexpected way. The opening of the Berlin Wall, largely unintentional, was such an event, an unsettling thought for those who see history as the result of strategy and planning by pivotal leaders. And so Britain continues its decades-long decline in influence. The nation’s candidate to become the first President of Europe is likely defeated, with reports out of Brussels saying that Tony Blair lost because he and his island friends wanted the job too much. The campaign for Mr. Blair also suffered from a brazenness that is not in tune with the more subtle approach to diplomacy á la Européenne. Compare Mr Brown’s manoeuvrings to the quiet but effective manoeuvrings of the Dutch team, who have managed to get their man in pole position just by working the EU’s diplomatic ropes like pros. No bother. Now it’s time to lay the groundwork to become the next UN Secretary General! The FCC recently voted to advance the process to pass “Net Neutrality” regulations, something Rep. Marsha Blackburn (R-TN) and others have called “the Fairness Doctrine for the Internet.” CFIF’s Renee Giachino discusses the issue in this week’s Freedom Minute. Watch the video below. It wasn’t the first time Pelosi (and other current Congressional leaders) made that promise. Nor was it the last. “The House ethics committee said Thursday that it was opening two new investigations — one into the foreclosure scandal of Rep. Laura Richardson (D-Calif.) and one involving financial questions about Rep. Maxine Waters (D-Calif.) and her husband. “But shortly after the committee met, chairs Zoe Lofgren (D-Calif.) and Jo Bonner (R-Ala.) interrupted proceedings on the House floor to say that an internal document on secret committee proceedings had been leaked to The Washington Post — and that it would name the names of many other members who had drawn the attention of either the committee or the Office of Congressional Ethics. Read the full Politico.com story here. The Washington Post had the scoop. The report by the Post’s Ellen Nakashima and Paul Kane can be read here. If you are not already signed up to receive the Liberty Update, sign up here. For those of you who haven’t had a chance to read Speaker Pelosi’s 1,990 page monstrosity of a health care bill, CFIF has provided a few summaries here and here. Today, a short one-page document was released covering the major provisions in the health care bill. It is a brief overview organized by page and section. You can read it here. It’s nice to see a piece in Time Magazine worthy of linking to. Over the last few years, Time has led the charge of weekly news magazines becoming equal parts liberal opinion journals and People Magazine derivatives. Newsweek isn’t much better (only George Will and Robert Samuelson redeem it). And U.S. News and World Report has become entirely virtual, while simultaneously losing its only compelling columnist (Michael Barone, who’s now with the D.C. Examiner). But Time’s new issue features a piece called “What’s Still Wrong With Wall Street” by financial journalist Allan Sloan. If you can get past the purple prose of his first few paragraphs (including a breathless passage about the “green shoots” appearing in the cracked driveways of the newly impoverished) and the occasional populist nonsequitur (Mr. Sloan apparently thinks the financial crisis should relieve him of the need to pay overdraft fees), it’s worth your time. The two divisions at AIG that brought down the firm — financial products and stock-lending — didn’t understand what they were doing. Financial products wrote credit-default swaps — sorry I’m not pausing to explain them, but most eyes would glaze over if I did — that they thought were riskless but turned out to be ultra-risky. The stock-loan department, AIG’s other disaster, took the cash it got for lending out stock owned by AIG and invested the money in esoteric securities rather than in risk-free Treasuries, the standard practice. The idea was — I’m not kidding — to make an extra one-fifth of 1% in interest. When the esoterica, which the stock-loan folks thought was riskless, crumbled, so did the firm. It’s an admittedly uneven piece, but the good outweighs the bad. Read the whole thing here. “Exxon’s Profit Drops 68% as Prices Tumble,” according to the Wall Street Journal. Is it time to move away from the windfall profits tax and start discussing bailouts? An AP story today shows that the Obama Administration overcounted the number of jobs “created or saved” thus far by the stimulus package by about 5,000. That may sound like small change, but not when you realize that the Administration’s entire claim was only 30,000. In other words, one in every six of those jobs is make-believe. Here’s an intellectual exercise to lay the stimulus bare. It came into effect on February 17 — 254 days ago. Based on the newest estimates that means it’s created about 100 jobs a day (or 2 per day per state). Leaving aside the opportunity cost of pulling the stimulus money out of the private sector, does anybody think that 14 jobs a week is going to pull California out of the morass? The Ways and Means Committee just sent out a summary of all the “revenue enhancements” (err … tax hikes) in the new Pelosi health care bill. However, these revenue enhancements add up to only ~$565.5 billion, which falls far short of the bill’s $800-$900 billion price tag. The list of “spending cuts” has not yet been released. A $5 billion tax hike achieved through narrowing the definition of a qualified medical deduction. Currently, individuals with medical expenses exceeding 7.5% of adjusted gross income can deduct those expenses for tax purposes, but the House bill severely limits this medical deduction, forcing taxpayers to pay more in out-of-pocket medical expenses. A $13.3 billion tax increase achieved through limiting Flexible Spending Accounts (FSA). Under current law, individuals may contribute money to tax-free FSA’s, but the new bill limits this amount, thereby taxing income used for medical expenses. Click here for the Ways and Means summary. Sec. 345. Income determinations. To determine income, the Health Choices Commissioner uses income data from the individual’s most recent tax return. Sec. 511. This section also provides for an excise tax that applies to an offering employer if the employer fails to follow the rules governing an offer of coverage. Sec. 512. Health care contributions of non-electing employers. Establishes a payroll tax of 8% of the wages that an employer pays to its employees for employers who choose not to offer coverage. Sec. 551. Surcharge on high income individuals. Establishes a 5.4 percent tax on modified adjusted gross income in excess of $1 million in the case of a joint return ($500,000 in the case of other returns). Sec. 552. Excise tax on medical devices. Establishes a 2.5 percent excise tax on medical devices sold for use in the U.S.
Click here for the House health care bill. Warning: it’s 1,990 pages. Update: Here is a short 4-page propaganda summary from the House Ways and Means Committee. You Can’t Handle the Bill! After taking intense criticism for not being open and transparent, the House of Representatives just posted a new version of health care “reform” online. If you have a slow Internet connection, then you better take a coffee break while downloading. The bill is 1,990 pages or more than six football fields long when placed end-to-end. Democrat Congressman Charlie Rangel, in conjunction with Senator Max Baucus (D – Montana) has introduced a bill targeting tax evasion by Americans, of all things. And even more ironically, Rangel’s bill targets offshore tax evasion. This is the same Charlie Rangel who shamelessly failed to report up to $780,000 of his own overseas income, and is currently attempting to dodge a thorough investigation into the matter. Under his legislation, overseas bank customers would suffer a punitive 30% tax on income from domestic assets unless their banks agreed to disclose the identities of American customers and report their annual balances and account activities. Proponents claim that it would raise some $8.5 billion more for spendthrifts like Rangel and his Congressional cohorts to waste away. Here’s an alternative: why not simply itemize the outstanding tax liabilities of Charlie Rangel, Tim Geithner and the rest of Congress and the Obama Administration? Perhaps that would make $8.5 billion seem like peanuts by comparison. From a 1994 Congressional Budget Office report on the Clinton health care plan. For those concerned with the integrity of electronic ballots, the announcement by one of the leading providers of e-voting software should be welcome news. According to Wired.com, Sequoia Voting Systems plans to publicly release the source code for its new optical scan voting system. The decision to disclose was reached after protracted negotiations and litigation with critics who charged that Sequoia’s vote tallies often counted more votes than ballots cast. Of course, as anyone familiar with elections will attest, accurately tabulating election results is a perpetual problem. But getting the “bugs” worked out of a computer system will go a long way towards avoiding the recurrence of Ballot Box 13 and other cases of deliberate fraud. Net Neutrality – Merely a Trick on Internet Users or Just a Treat for Google? 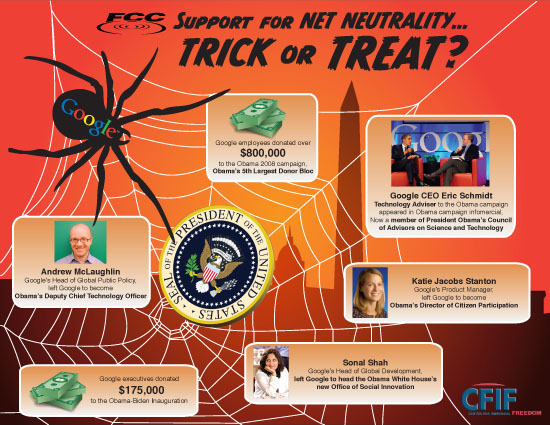 As President Obama’s FCC moves forward to impose burdensome Net Neutrality regulations on the Internet and just in time for Halloween, CFIF this week released the following illustration highlighting the intricate web between the Obama Administration and Google, a leading supporter of Net Neutrality. The illustration raises the question: Is Net Neutrality merely a trick on Internet users or just a treat for Google’s welfare?